An average person consumes 1-2 kg of food, 0,5-2 liters of water per day. Same person passes from 15 to 20 kg through his or her lungs . For thousands years we treat our food before consuming it. We wash fruits and cook meat and fish. For decades we drink only purified water. Our bodies become accustomed to the new conditions and its resistance to the dirty food and water has subsided. And what about the air? Over the past century, air quality has deteriorated. It contains industrial dust and chemicals. Our weakened body absorbs all the more dangerous substances by their breathing. You can limit yourself to food and water, but can not stop breathing even for several minutes. Therefore, the demand for the air purifiers is growing. They found the way to our homes, offices, cars. If we consider that modern man spends 90% of the time indoors, interest in the air purifier is understandable and well justified. The problem is which of the many models available on the shelves suits you the best. Choosing the right air cleaner is far from simple. Let us first recall what contamination air should be cleaned of. Do you know how much dust you take each time you breath? Of course, you do not know, because this is not correct question. First of all, what is “dust”? In Wikipedia, “dust” is defined as solid particles from 5 to 100 microns in dimension. The diameter of a human hair is from 40 to 100 microns. Human hair does not penetrate to your lungs, but the dust particles do penetrate and can cause you trouble: from hay fever and bad feeling to serious illness. Of course, there are more smaller particles in the air. Why not? Generally accepted standard for the air purifiers defines particles’ size up to 0.3 micron. Why 0.3 micron, and not, say, 0.02 micron? * 0.3 microns – the minimum size of the particles that can be easily detected by non-expensive laser counter. * Particles of this size are successfully filtered by conventional air purifiers. When certain amount of air passes through the laser beam, the beam is reflected by certain angle. The greater particle size the bigger is the angle. Available particles counters can detect number of particles of a certain size in each liter, cubic meter, and a single breath. In the photo you see one of the laser particle counter, calibrated in cubic meters. Measurements were made in a fairly clean office, but with no air cleaner. The smallest particles per cubic meter counted for more than 50 million, and the largest (5 microns and above), only 17 thousand. Small particles are not only bigger, they are easier to get airborne and easier to penetrate into the lungs. Of course, there are particles with a size smaller than 0.3 microns. However, their removal and monitoring is much more difficult, so most manufacturers and developers of air purifiers simply not to bother. Good enough to deal with this dust. Do not forget, however, that the air also bears microorganisms: bacteria, viruses, mold. What is their size? Ebola viruses are even smaller – about 0, 2 microns, and rhino viruses up to 0.02 micron, or 20 nanometers. That brings us to very obvious conclusion: a good air purifier must successfully remove large and small dust particles, and get rid or kill various microorganisms. Air purifier shown here is located in the middle (the white wire goes to it), a carefully polluted air enter through the top. It should contain about 150.000 special dust particles (Arizona Road Dust) in a cubic foot. Particle counter is on the bottom. Meticulous person would get laser particle counter and measure the amount of dust right at the air purifier outlet. And in most cases the result is frustrating. Instead of instead of the declared99,97% the customer will find merely 95%, or 90%, or even 80% filtration, i.e., dust count immediately after the air cleaner will cjntain, respectively, 150, 300 or even 600 times more than was promised. How can that be cheating? No, it is absolutely true. The advertisement claims that the cleaner contains a filter with the purification rate of 99,97%. Trick is that the cleaner itself is designed in such way that only portion of the air passes through the filter. HEPA (High Efficiency Particulate Air) filters are made of dense fibrous material, folded like an accordion. In order to blow air through the filter requires a fairly powerful fan. A powerful fan requires more electricity, is noisy and cost more. Here are the producers on tricks to attract customers with lower cost and quiet operation. But the filtration coefficient is not the main thing. An important indicator is the amount of air purifier that is able to clean out over the time. Which is better: a small amount of air filter with high filtration and a large number of the poor filtration? The answer is: neither is good for you. The American Association of Home Appliance Manufacturers (AHAM) has developed an integral criteria for air purifiers quality It is CADR (Clean Air Delivery Rate). CADR tells us how much of the clean air the air cleaner can produce. For instance, first air cleaner passes through a 100 cubic feet of air per minute (CFM) and cleans air with 100% efficiency. This cleaner has a CADR = 100. Another cleaner passes 200 CFM, but retains only 50% of the dust. Its CADR is still the same 100 = 200 * 0,5. AHAM experts went further and proposed a simple formula to determine CADR good for specific areas. The area of the room one wants to keep clean, should be divided by a 1.5. If you clean the air in the room (bedroom, dining room, kitchen, office) of 200 square feet, you need air cleaner with CADR no less than the 200/1.5. Now you go to the store and ask for air cleaner with CADR about 130. 1. Ozonators that produce ozone and smell like the air after a thunderstorm, or a linen from the cold. 2. 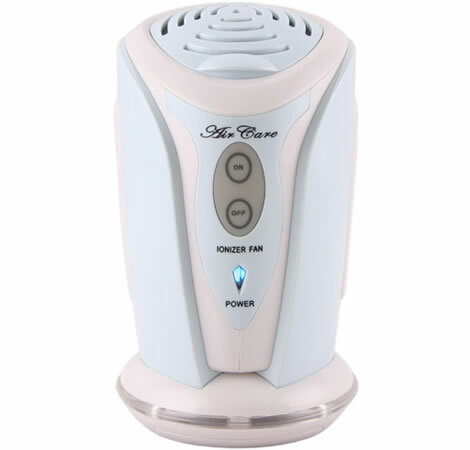 Ionizers, generating “air vitamin”, i.e., negative ions. 3. Ultraviolet disinfecting lamps, that deactivate various microorganisms. 4. HEPA filters that pass air through the close-meshed fiber and colled all the dirt inside. 5. Electrostatic purifiers, with particles deposit on the electrodes. Ozone is triatomic oxygen, with chemical formula O3. Ozone has high chemical activity. It disintegrates rapidly under ordinary atmospheric conditions, but before that manages to go into chemical reaction with all it comes into contact, including living matter. Ozone is bactericidal and finds the use in water purification. Manufacturers of ozone generators claim that it may be used for air disinfection in your room. What they forget to tell you, that the efficient ozone concentration should be many times higher than acceptable standards for humans. We – human beings are more fragile than bacteria. Therefore, the ozonator should be used with caution. They are generally allowed to use only by trained professionals and only for short-term disinfection of the premises or for the odor removal. Ionizers are in high fashion thanks to the late Russian scientist Alexander Chizhevskiy. They are convenient and compact air purifiers. If you put an ionizer in the room and begin to measure the dust content in the air, you will find that the dust concentration is significantly reduced within the first hour. That is, small and energy efficient ionizers have really high CADR. The dust will remain low further, causing the user’s meticulous legitimate bewilderment: where it goes? And only a couple of days later the puzzle shows itself as a “halo” dark spot on the wall next to the ionizer. Part of charged dust settles on the wall, part – on the floor and ceiling, but a large part – in your lungs. Not to mention that the health effect of both negative and positive ions is questionable. Ultraviolet purifiers do not remove dust at all. Ultraviolet lamp is designed to kill microorganisms. It can also damage your eyesight, so you should not look at it when it works. That limits the use of ultraviolet lamps. In addition, microbiologists know that ultraviolet light does not necessarily kill microorganisms. In some cases, they just become inactive for a while and, after a certain period “wake” and resume their destructive activities. In addition, bacteria and viruses that are not exposed to the light, just do not bother at all. Microorganisms, hiding under the bed, under a blanket, in a drawer, feel safe and secure. HEPA filters actually clean the air if their CADR is right to the size of the room. All the dust settles on the very real filters and remain there, not on walls or in your lungs. Take, for example, the room is an area of 150 square feet and ceilings at 8 feet. The room volume is equal to 1200 cubic feet. Such room requires the air purifier with a CADR as big as 100 = 150 / 1,5. Such purifier passes all room air 5 times per hour. Every 12 minutes all the air enters the purifier leaves it with a little dust. One can ask: why should air purifier be ON all the time and drive the air constantly? Is not that enough to clean all air once and then turn teh air purifier OFF? It is noisy, by the way. Most of the air cleaners produce 60-70 decibels of the acoustic noise. This roughly corresponds to the sewing machine chatter or loud conversation. If one turns air purifier OFF that means the air in the room stays clean, right? Dust count was initially about 80,000 particles per liter. Fairly quickly, within 15 minutes after the cleaner was turned ON, dust content went down to the very low level. The air in the office has become cleaner than in the most wonderful mountain and seaside resort. It remained at that level for the next 600 minutes. After that the cleaner was turned OFF and … the dust count very quickly rose to the initial level. That is, in order to effectively clean the air, the air cleaner should run continuously. The dilemma is: while cleaning the air, the air cleaner fills the room with the noise. Instead of air pollution we face noise pollution. And it is harmful to our health too. The better air cleaner filters the air, the denser the filter it uses. Dense filter requires elevated fan power and … it is noisier. The best air cleaner we ever tested happens to be as noisy as passing train. Now let’s ask the question: where did all the dust disappears? It is deposited in the filter pores and clogs them. After a fairly short time, a week or two, the air cleaner performance is reduced. After 3-4 months the user is recommended to change the filters as fairly useless. The old filter is removed and thrown away, the customer has to purchased a new one. New one costs almost as much as the air cleaner itself: tens and in some case hundreds of dollars. So, what can we do about it? To live with the constant noise and throw money 3-4 times per year? Electrostatic cleaners are known for more than a century and have been successfully epmployed for industrial applications. If you look inside such a device, you may find the corona electrodes in the form of a thin wire or a set of sharp tips. This electrode emits ions that attach themselves to the dust particles and electrically charged them. The charged particles are then attracted to the collecting electrodes, which looks like a series of parallel plates. Dust and ions are deposited there. Ion charge is returned to power source, and the dust remains on the plates. Clean air and, most importantly, without ions, fills the room. Here is the fundamental difference between the electrostatic cleaners and ionizers. All air cleaning is done inside of the air purifier. No noise, no ions. no pollution come out of it. After some time (several weeks or months) collecting plates should be removed and the dust washed off them with water or with a special detergent. The electrodes are again ready for use. Cheap and cheerful. In some types of electrostatic cleaners ions are attracted to the collecting electrodes with such force that they push air molecules thus forming quite perceptible movement. It can, for example, to extinguish a candle flame. Such electrostatic purifiers require no fan. Nothing moves, except of the air. Purifier consumes little power and runs silently. Is that complete solution? Not yet. the company soon faced “Consumer reports” review. “Consumer reports” experts concluded that “Ionic Breeze” have very low CADR (17-20) and the air in a normal room is not being cleaned at all. Moreover, these devices generate excessive amount of ozone. It was more than 50 molecules of ozone per billion molecules of air (50 ppb) for first Ionic breeze models. “Sharper” did not agree with the experts, filed a law suit, lost it and, as a result of that and some other factors went bankrupt. Nevertheless, the idea of electrostatic purifiers, silent and effective, continues to attract consumers. Really efficient electrostatic air purifiers should hit the shelves soon. They have an impressive CADR (100-200), did not produce any appreciable amount of ozone and clean air of the dust and pathogens (bacteria and viruses). Above article is very wonderful !!! is there any chance for cooperate with you on air pruifiers , also Ozone air purifiers .